Banned by the Bolsheviks, Christmas is celebrated on January 7 – after the bigger New Year celebrations, when gifts are exchanged. Within the first few days of December, Moscow’s streets are lavishly decorated for the festive season, with Christmas trees and lights. The season lasts until early January as most Russians celebrate Christmas Day on January 7, by which time Christmas decorations are safely back in their boxes in most British households. 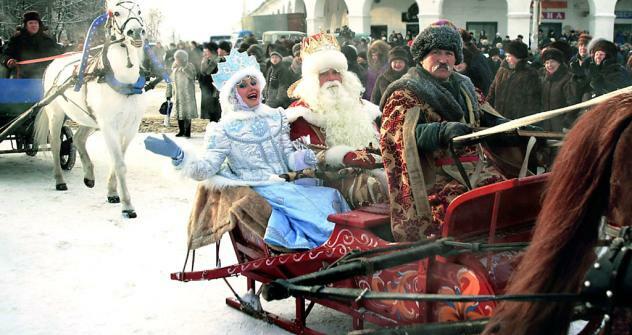 In Moscow, celebrations begin on December 24, when the official Ded Moroz (Father Frost), a legendary Father Christmas-type character, arrives in Moscow with his granddaughter Snegurochka (the Snow Maiden), from their official residence in the old Russian city of Veliky Ustyug 95 miles north of the Russian capital. They are the main heroes of the Russian winter holidays, and their arrival is celebrated at Gorky Park. This event was introduced when former Moscow Mayor Yury Luzhkov was in power. Alongside this new tradition, special postboxes now appear in Moscow parks in December so that children can send a letter to Ded Moroz. If they provide an address, they will receive a response from Father Frost. Like Santa Claus, Ded Moroz has long been part of the tradition, bringing gifts to children all over the country. But in Russia, the date on which he does so is not Christmas, but New Year’s Eve. About 300 years ago, Peter the Great returned from a trip to Europe and brought a Christmas tree with him. Some other traditions associated with celebrating Christmas and New Year – such as giving presents – were adopted at the same time. For two centuries, Christmas and New Year were celebrated in the same way as in the rest of Europe. But the situation became complicated after the October Revolution. The Bolsheviks, who came to power in 1917, changed the tradition. The atheist regime banned people from celebrating the birth of Jesus Christ openly and even banned the decoration of fir trees. Believers who concealed their devotion to the Orthodox Church had to celebrate Christmas secretly. Members of the Communist Party could be expelled for attending a Christmas service in one of the few remaining Orthodox churches. A few years later, however, the top party officials realised that the country would not do without its principal winter holiday. They decided to allow celebrations once again, but on New Year’s Day – a day that had no associations with Christianity – instead of Christmas Day. They did, however, allow some of the traditions associated with Christmas, such as decorating the fir tree and present-giving, to take place on New Year’s Day. Ded Moroz, a pagan character from Russian folk tales, was invited to attend the New Year celebrations. The first official Soviet New Year celebration was held in 1937. That year, Ded Moroz appeared in the lives of Soviet people as the main hero of the New Year celebrations, placing presents under the New Year trees. By the late Forties, New Year’s Day had become a public holiday. When the Soviet regime collapsed more than 50 years later, the New Year’s Day celebrations had taken root in the popular consciousness and to this day, it remains the most-loved and popular Russian holiday. On this day each year, families gather round a festive table and, right after the clock strikes midnight, drink champagne and then exchange gifts which had been hidden under the New Year tree by Ded Moroz beforehand. The fact that Christmas has regained popularity since the end of the Soviet era has not seriously affected the tradition of celebrating New Year’s Day. In 1918, the Council of People’s Commissars decreed that the Gregorian calendar (which was in use throughout Europe at the time) would replace the Julian calendar. This involved a 13-day shift in dates. However, the Russian Orthodox Church remained true to the Julian calendar, which meant that, according to the Gregorian calendar, they celebrated Christmas Eve on January 6 and Christmas Day on January 7. The Catholics, though, adopted the Gregorian calendar and celebrate Christmas in December. January 7 was officially declared a public holiday in 1991. And since 2005, Russia has enjoyed a lengthy Christmas vacation – from New Year’s Day through to January 10. Orthodox churches hold Christmas services on Christmas Eve, the most impressive of which is at the Cathedral of Christ the Saviour in Moscow. Conducted by Kirill, the Patriarch of Moscow and All Russia and head of the Russian Orthodox Church, it is attended by the country’s leading officials and the event is broadcast live on television. The Christian and the secular winter holidays complement each other, and create a fantastic atmosphere in the streets of Russian cities and in the hearts of both believers and non-Orthodox citizens. The only slight problem with having Christmas Day after New Year’s Day is that the growing number of Orthodox believers maintain a 40-day nativity fast before Christmas, when dairy and meat products are prohibited and fish is allowed only on specific dates. But even this demanding traditional routine cannot spoil the much-loved New Year celebrations for believers.